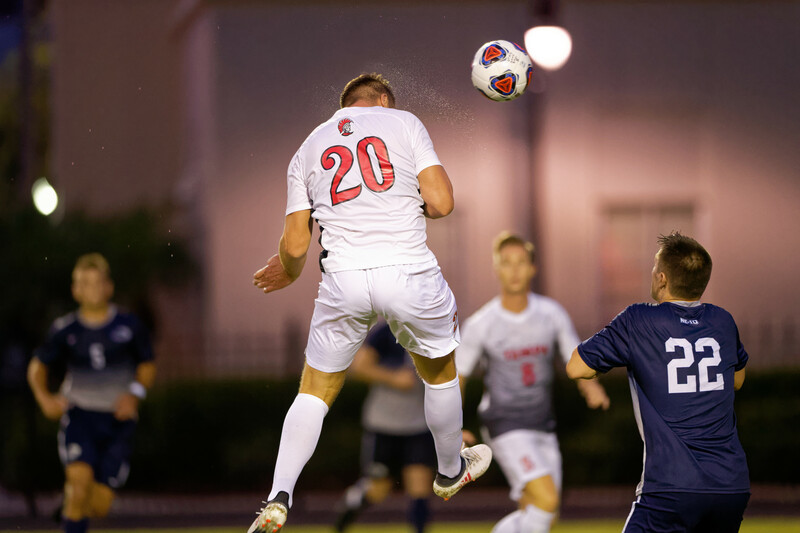 On Sept. 19, the men’s soccer team had their first win of the season against Eckerd College in St. Pete with a final score of 2-1. During the first half the Spartans were on fire scoring two goals in the first 10 minutes. Marcel Salokat, forward grad student, scored his second goal of the season in the eighth minute while Juancho Fernandez, forward junior, scored his second goal of the season as well after 10 minutes of play. Jake Richards, goalkeeper senior, made three saves on nine total shots during the second half. In the 59th minute, Eckerd scored against Tampa, making the scoreboard 2-1. The match came down to the end after Richards made a save against the Tritons in the 87th minute, holding the 2-1 lead. On Sept. 22, the Spartans fell to fifth-ranked PBA during over time. This was the fourth time that Tampa played into extra time and the first loss after regulation. During the first half, Till Neumann logged his second goal of the season in the 23rd minute. Neumann finalized the ball in front of the 12-yard line, and shoot into the lower left corner, passing the diving keeper. Both teams registered five total shots in the first half, but only the Spartans were able to put the ball on net. In the second half, the Spartans were carried by Jake Richards who recorded four saves. Because of a yellow card to Ramzi Toure, PBA got a penalty kick, however, Richards defended the Sailfish attacker, keeping UT in the lead. In the 62nd minute, PBA was able to put the ball past Richards, making the score at 1-1. During the overtime, Jack Burrows, Sailfish player, finished the match by settling the ball with his chest and shooting from beyond the 18-yard box, passing Richards. On Sept. 19, the women’s soccer team won once again against Eckerd College at home. Head coach Erin Switalski is undefeated against Eckerd with UT has winning the last six matches. During the first half, Emily Cady, forward junior, scored her fourth goal of the season in the 29th minute. Nastasia Asgedom, middle fielder senior, made the assist to Cady, and Cady was able to put the ball into the upper right corner of the net. The Tritons tied the game in the 69th minute after forward Stephanie Linton scored her fourth goal of the season. However, Asgedom nailed her sixth game-winning goal of her UT career in the 75th minute, giving the Spartans a 2-1 advantage. On Sept. 22, the Spartans competed against 48 teams at the University of Arkansas Chile Pepper Festival. The men’s cross country team ended up in 17th place with a total of 454 points. Trevor Kattenberg, sophomore, finished the 8K race in 48th place, with the time of 25 minutes and 45 seconds. Following him, Tyler Roberts arrived in 87th place with a time of 26 minutes and 17 seconds. Kattenberg was the first Spartan to finish the race for the second time in 2018. On Sept. 22, the women’s cross country team competed with the nation’s best at University of Florida Mountain Dew Invitation, finishing up in the first place among Division II schools. Zoe Jarvis, sophomore, crossed the line in 4th place, finishing the 5K race with a time of 17 minutes and 47 seconds. A few seconds later, Shannon Sweeney arrived in the 6th place with a time of 18 minutes and eight seconds. Jarvis was the first Spartan to finish a race for the third straight race of 2018.